To anyone looking on from the outside, Yasmin Swift might look like any other teenager. But the Ashford girl's gleaming smile and cheery demeanour masks a serious lung disorder which severely limits the quality of her life. After being diagnosed around seven months ago with idiopathic pulmonary arterial hypertension, the 19-year-old hairdresser has faced a daily battle, struggling to do the simplest of tasks without becoming out of breath or exhausted. The condition occurs spontaneously, has no known cause and has a life expectancy of up to 17 years with IV line medication therapy. It has forced the former Homewood School pupil to take six months off work as she learned to cope with its symptoms. And although Yasmin told Kent Live that in some ways her diagnosis - after a year of waiting - made things easier, there were other things that would never be easier to cope with. hese were things like the reaction from some people whenever she parks in a disabled space. Because although Yasmin is perfectly entitled to do so, her invisible illness means others make judgements on whether or not she is actually disabled. That is is exactly what happened yesterday evening (July 19) when the former St Michaels resident headed to a pub in Tenterden with one of her friends. 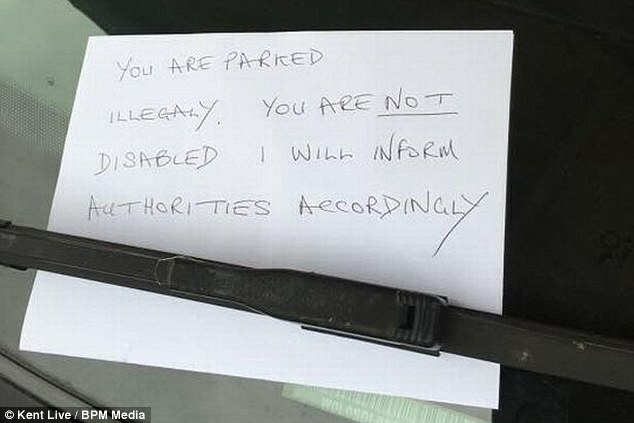 After parking in a disabled space outside the Prezzo on the high street, and despite fully displaying her blue badge, a cruel note was attached to the windscreen of Yasmin's car. Shocked and hurt by the brazen note, Yasmin took to Facebook to call out whoever left the message, eager to raise awareness about peoples' attitudes to invisible illnesses. Yasmin said discovering the note made her 'furious' and desperate to challenge outdated attitudes about disabilities. She said: "Whoever wrote this couldn’t write their name, couldn’t write their number and didn’t want to approach me in person." So although Yasmin couldn't confront the person who left her the note, we have published what she told the incident in full below. Last night I went to the White Lion in Tenterden with my friend and parked my car outside Prezzo in the disabled space and, honestly, I didn't think anything of it. Luckily it was still there this morning. I was angry and frustrated. To be honest it does make me laugh because I just think people are so arrogant to people with invisible illnesses. Where I'm young and I look well people are just so quick to judge. When I put my badge up I feel like I have to walk out of the car limping. But I shouldn’t have to feel like that, because there is an illness there but it just doesn’t show. I’ve only recently been diagnosed with idiopathic pulmonary hypertension, in December or November last year. It’s a life limiting illness. It gives me shortness of breath, tiredness, some people even black out and faint. When I first started getting symptoms, the main thing that I noticed was my legs swelling up, My stomach, my back, and my eyes also became really puffy and sore. I was literally walking the distance of a room before I had to stop walking. My exercise routine went from healthy to non-existent. Where I used to go to the gym five times a week, my health was just getting worse and worse. My symptoms developed gradually, but in the last few months leading up to my diagnosis it was just getting worse and worse. My mum said she was scared she would lose me. In all, it took me a good year to get a diagnosis. I had so many tests it's difficult to count. At one point it got really bad, I was constantly in and out of A&E. The diagnosis was a relief at first but now its just difficult to live with. Now I'm on medication its more manageable, I’ve actually had a pump fitted now which I have to take my medication through, it's permanently attached to me. If I could speak to you, the person that left the note, I would say, just please don’t judge. Just because I'm not in a wheelchair or have a visible ailment, it doesn't mean I'm not entitled to use a disabled space. On the one hand I just wish I had been able to see you so I could speak to you. But on the other, actually I wouldn’t want to waste my breath on someone so judgemental. I understand that you could make that judgement, but its one of them things you might maybe think but you wouldn’t actually goto the point of actually writing that on someone's car. It's not all bad though because after posting about the note on social media, the reaction from people on Facebook has been amazing. A lot of people are commenting and I cant even look properly. I'm just scrolling through taking it all in. Everyone has been really nice and just really supportive about it all. I think everyone is angry about how someone could make that judgement. I just hope that the post makes people think before they jump to such damaging conclusions. Something like that it could seriously affect someone with an invisible illness. It's lucky I am how I am and it just kind of brushes past me, but to some people that note could have had a big effect on them. According to the NHS, Pulmonary hypertension is high blood pressure in the blood vessels that supply the lungs (pulmonary arteries).